Environmental concerns have spurred a remarkable growth of electricity generation from renewable energy sources the last two decades. Additionally, the endeavor of many countries to get subsidy new units such as battery storage systems, electric vehicles and fuel cells, propels a further integration of Distributed Energy Resources (DERs) into the electric grid. These sources are not consistently owned by the System Operator which essentially hardens the task of managing and operating the network. The advent of Smart Grids brings advanced automation and communication infrastructures into the low voltage distribution network premises (Fig. 1) in addition to smart meter (SM) apparatuses. These cutting-edge technologies aim at establishing a conceptual and technical vision of the grid operation for the new reality set forth by the integration of DERs. Besides, these breakthroughs impart intelligence along the network operation and management, whilst in the frame of the end-user intelligent load management (LM) is emerging by “smart appliances” capable to interrelate with the SM. Moreover, the SM infrastructures are the key enablers linking-up real time measurements to the system operator or even to the end user itself. Therefore, arises the possibility to dispatch multiple tariffs for the purchase of electricity to the smart meters releasing the capability of the DERs participation to distribution networks’ operation. These trends lead to radical changes to the end-customer’s standpoint on the electricity grid and, conversely, the view of the sector on the end-customer, residential, commercial and industrial customers alike . Concurrently, the electricity end-user is gradually becoming pro-sumer in the sense that produces energy through micro-generation units that owns at its premises. Paving this way, the pro-sumers and generally the end-users will strive to adapt more their own sources delivering flexibility to some extent to the grid operation. The latter, has been recently recognized as a key enabler for smart energy management in the grid. 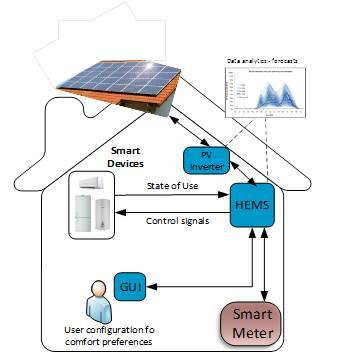 This can be explicitly accomplished in favor of Home Energy Management System which is a house-centered system able to coordinate its consumption, storage and production (if exist) in the most cost efficient way, meeting user’s comfort preferences (Fig. 2). This sort of flexibility might be of significant importance contributing on the balance between demand-supply in the grid. The increasing integration of intermittent generating sources (i.e. wind and sun) create the need for such flexible units that possibly compensate the temporal and spatial variability (i.e. provision of ancillary services namely reserve services). Nowadays, electricity markets that are liberalized (see January’s article), include this type of balancing services are cleared in the wholesale clearing process. Nevertheless, the residential sector is usually comprised of small sized individual LM sources of considerably lower rated power compared to the total demand. Therefore, the need to the establish new entities -the so-called aggregator- is elicited. The aggregators will then act as a market delegate to bid in the wholesale market the aggregated flexibilities . The primary challenge of electric grids is to increase the hosting capacity for Renewable Energies as well as to ensure a proper interface between DERs and the electric utilities. On that way, the existence DERs along the network is harmonized with network’s operation (see October’s article). Aligned to these directions, the control of demand might be a flexible resource which is substantially comprised by consumers (of any type) who adjust their demand profile due to a command order by the grid operator. This is typically referred to the as the demand response (DR), which can be implemented to procced to quick actions (Fast DR) of electric loads to cope with frequency regulation. The DR primarily targets on shifting load from peak-demand periods when costs tend to be highly rated, to off-peak periods when costs are lower (i.e. late evening hours). The smart reaction to these evolving changes is to involve the demand response in the control mechanisms of the electricity system. This substantially implies that changes in electric usage by end-use customers from their normal consumption patterns occur in response to changes in the price of electricity over time, or to incentive payments designed to induce lower electricity use at times of wholesale market prices or when system stability is jeopardized . Some different types of DR objectives are summarized in Fig. 3 regarding the reshaping of load curves as proposed by Gellings . 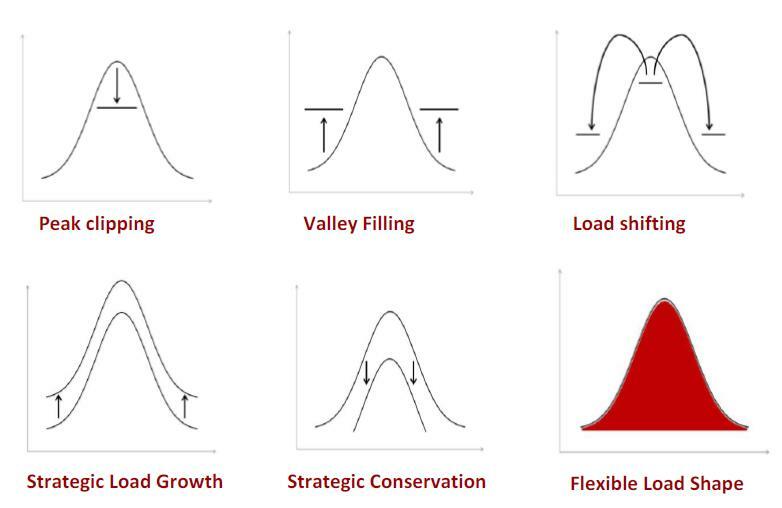 The notions of demand response and generally load management are not new, since several implementations launched in the early 70’s as a result of oil crisis (fears of nuclear meltdown) together with the abrupt increase of demand growth. Since the beginning several program designs have been proposed and implemented to promote the end-user engagement in such way to progress a cost-effective LM for both sides (i.e. the end-user and the system operator). The most common program designs can be discriminated in two broad categories based on the remuneration and end-user engagement design of the DR: contracted response and price or incentive based response . The contracted response programs were historically referred to commitments between the consumer and the system operator where the second might curtail (intrusively or after a short term warnings) the load in exchange to a discount fee. On the other hand, the price based DR programs allow the customer to voluntarily adapt its load in response to price or incentive signals sent from the utility. The technology was never a barrier to a massive implementation of demand response schemes. The bottlenecks though are met basically on the absence of adequate regulatory framework to adopt DR schemes, while there is a pivotal need to create sustainable business models which will involve incentives to the end-user at the retail level. The main drivers to further implement DR programs would be to promote the end-users’ acceptance and engagement on such schemes by providing noticeable cost savings in a fair and appropriate manner. The primary challenge on this turning point of the electric grids is to shift to sustainable economies through renewable energies and sustainable development, fact which can be evoked throughout the concerted integration of the DERs via DR schemes. C.C Liu, S. McArthur,et. al., Smart Grid Handbook, Wiley 2016, Volume 3. K. Koen, The Power Matcher: Smart Coordination for the Smart Electricity Grid, TNO 2013. M. Heleno, M. Matos and J. Lopes, “A bottom-up approach to leverage the participation of residential aggregators in reserve services markets”, Electric Power Systems Research 136 (2016) 425–433. Federal Energy Regulatory Commission, https://www.ferc.gov . Gellings, C.W., "The concept of demand side management for electric utilities", Proceedings of the IEEE , vol.73, no.10, pp. 1468- 1470, Oct. 1985.